White House Photos: Washington, D.C. The White House is the oldest public building in Washington, D.C. and has been the home of every president except George Washington. Visitors come from around the world to the nation's capital to get a glimpse of the impressive structure. The following White House photos show closeup views of the home and office of the U.S. President. Enjoy this photo tour and learn about the architectural features and more. This photo shows the north side of the building which faces Lafayette Park. This side of the White House is visible from Pennsylvania Avenue and a popular location for visitors to take photographs. The south side of the White House has many old trees and the large grassy area that is used to host the annual Easter Egg Roll and other outdoor activities. Marine One, the presidential helicopter, lands on the south lawn to pick up and drop off the President. This side of the building faces the Ellipse and the National Mall. Lafayette Park, the seven-acre park in front of the White House was named to honor the Marquis de Lafayette, the French hero of the American Revolution. The park is used for public events and is often a gathering place for protesters. The White House Entrance Hall as seen from the North Portico is a large formal space with pink and white marble with furnishings that include a French pier table purchased by Monroe in 1817, a pair of French settees with carved mahogany swans' heads and Aaron Shikler's portrait of John F. Kennedy. The Entrance Hall is used for ceremonial occasions when the President welcome's visitors. The East Room is the largest room in the White House and is approximately 80 feet by 37 feet. It is traditionally used for large gatherings, such as banquets, receptions, concerts, award presentations and press conferences. The Steinway grand piano was given to the White House in 1938. A full-length portrait of George Washington is one of several painted by Gilbert Stuart and has hung here since 1800. The Blue Room is the center of the State Floor of the White House where the President formally receives guests. This photo shows the Blue Room during the William J. Clinton Administration. During the holidays, the Blue Room is the location of the official White House’s Christmas tree. This is a view of the table settings in the State Dining Room for a White House Dinner. The room has oak paneling, three eagle-pedestal side tables, Queen Anne-style chairs, and circular tables. Approximately 140 guests can dine in the room for formal events. The Oval Office is the President's office and a part of the complex of offices that make up the West Wing of the White House in Washington DC. There are three large south-facing windows behind the President’s desk. The ceiling is adorned with an elaborate molding around the edge that features elements of the Seal of the President. The President decorates the office to suit his personal taste. The White House sits on an 18-acre plot of land in the heart of Downtown Washington, D.C. that is surrounded by parkland. The grounds are maintained by the National Park Service. The grounds include gardens, a putting green, a swimming pool, a tennis court and a basketball court. 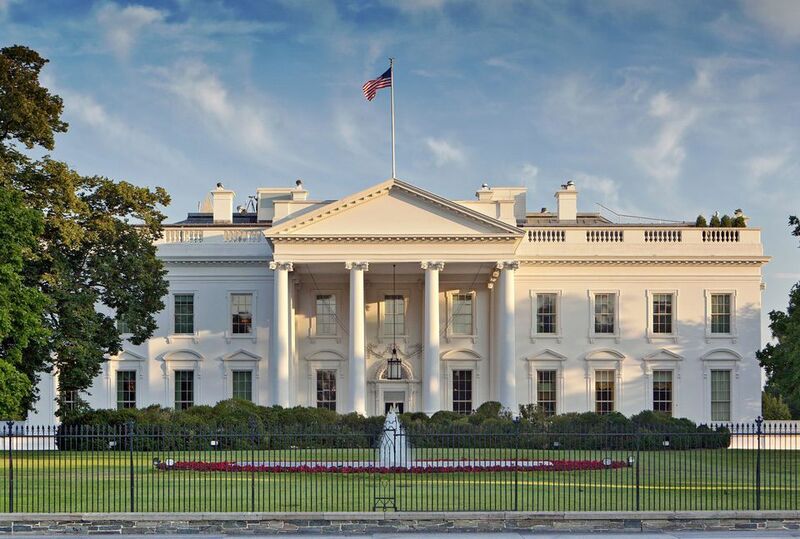 The White House has been the residence of every U.S. president since John Adams in 1800. The mansion was designed in a neo-classical style by Irish-born James Hoban. .During the War of 1812, the White House was burned and severely damaged. The building was reconstructed and expanded with the addition of the South Portico in 1824 and the North in 1829. The West Wing was added in 1901 and the first Oval Office was created in 1909. The Executive Residence is made up of six stories—the Ground Floor, State Floor, Second Floor, and Third Floor, and a two-story basement. This is a photo of the White House as it appeared at the time of William McKinley's assassination in 1901.